This weeks’ planner spread is fairly plain, but I do have some washi tape on each view so that there’s a bit of color and brightness in it! 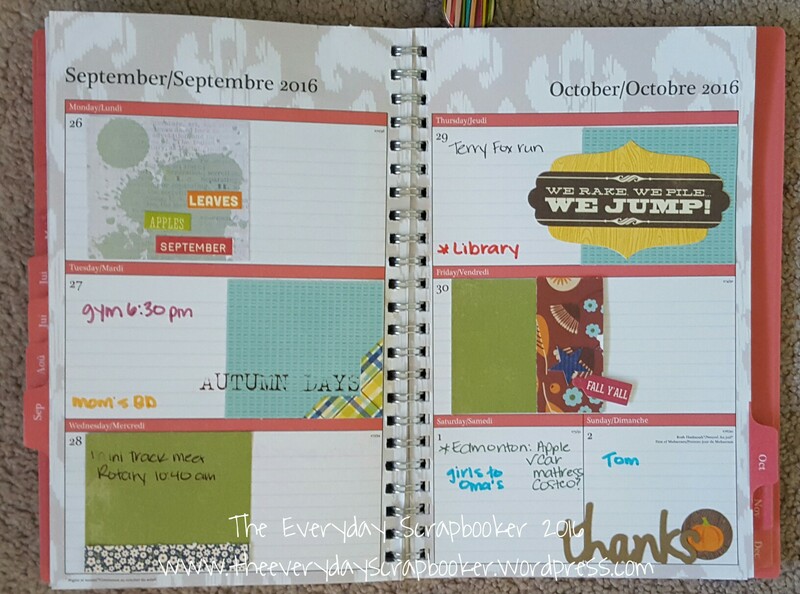 Not much is written in my planner, but last week was busy! On Saturday, the twins and I wandered into Edmonton to finish up back to school shopping. We left on Friday, after the alarm guy came to fix my home alarm system. What a rush! Hopefully next weeks’ spread will be slightly fuller and more decorative! Today’s planner spread was done in a bit of a rush. This last week has been full of laundry, laundry and more laundry and I’m still not caught up. We cleaned the trailer and put it away (for now), replaced the brakes in my car and celebrated back to back birthday parties. There’s been little time for crafting- let along planning and snail mail this week! Today also marks the beginning of our second round of swimming lessons. It’s the big push until school starts. The girls also informed me they’d like to go to art camp and science camp after school starts. Plus gymnastics. We’re going to remain busy, by the looks of things! The rest of the stickers are dollar store puffy word stickers and a couple Carta Bella chippy stickers. Of course, there’s washi and a tiny bit of stamping. 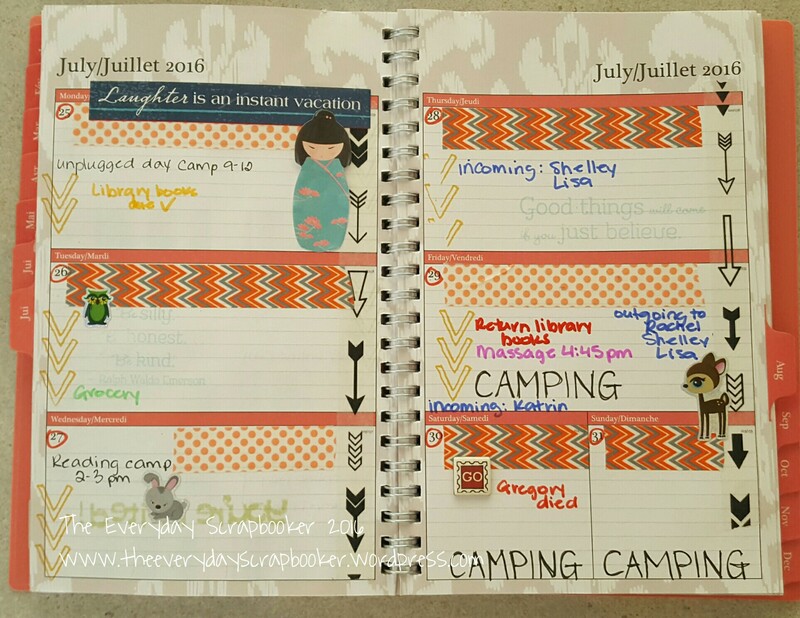 It’s another planner Tuesday, and as promised, I have a spread that’s full of campy, chippy stickers. 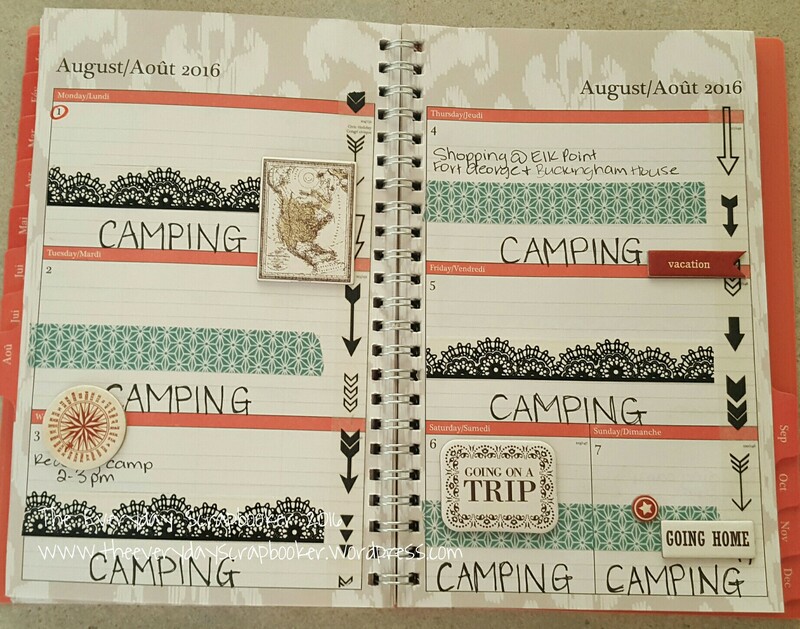 So, as you can see, there’s not much to share from last week, other than camping and chipboard stickers. We did sight-see a tiny bit on Thursday, and shopped for new school clothes for the twins. Other than that, we swatted flies, sweated and swam in the lake. Pretty chill! My daughter is sick today, so we’re just taking it easy and relaxing in and around the trailer. It’s a good thing it’s our last day here. I think we played too hard in the heat, and now it’s catching up with us. 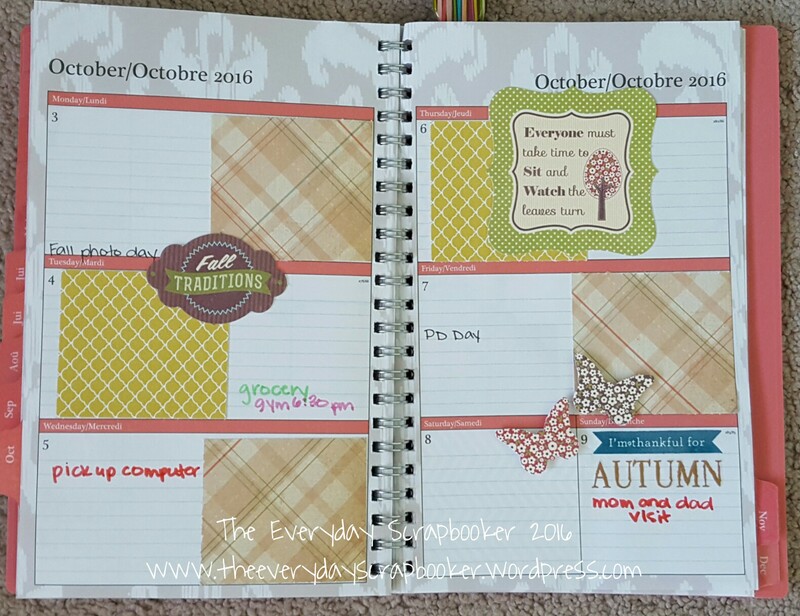 Since she’s feeling lousy, I thought I’d drop in and share last weeks’ planner pages that I missed sharing on Tuesday. (I have no snail mail to share because I’m not at home and obviously haven’t checked my mail in a week). I was already in a “campy” frame of mind, so chose woodland creature stickers (I stole them from my kids. Shhh, it’s our little secret!) I also chose stickers that are reminiscent of traveling. You’ll see that next weeks’ spread is full of travel- inspired chipboard stickers from Carta Bella. They work great in my planner. Stay tuned for it! 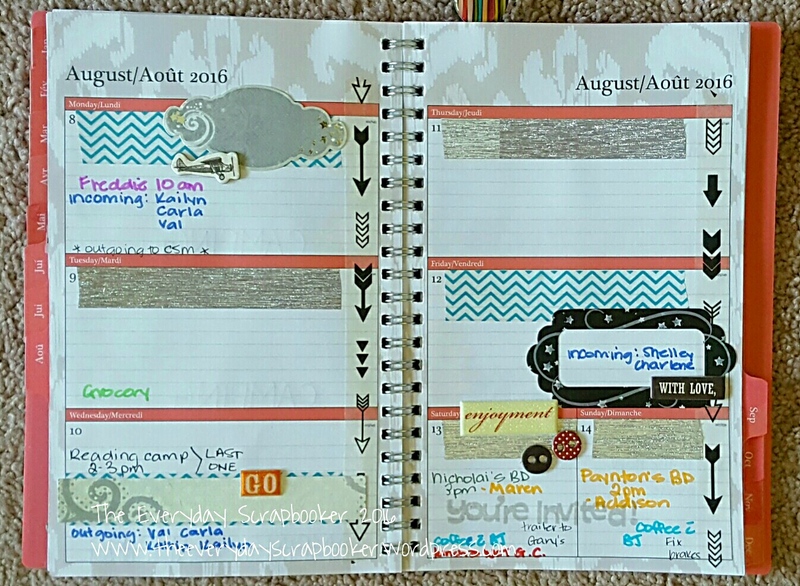 Since my spread this week is travel-themed, I also used my CTMH arrow washi tape to decorate my pages further. Thanks for joining me. 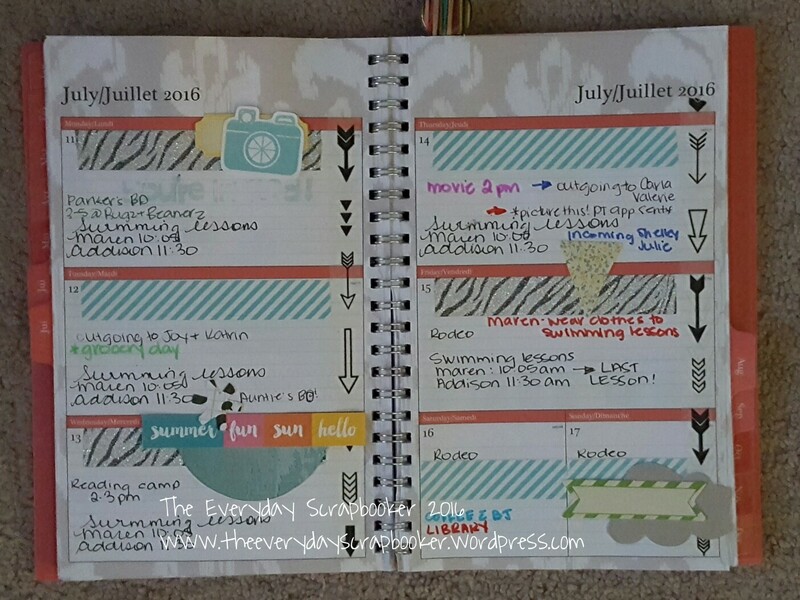 I hope you enjoyed my planner pages today! I haven’t been doing as much scrapbooking lately, and the scrapbooking I have done has (surprisingly) been staying in my layouts and not winding up in my scrap baskets. 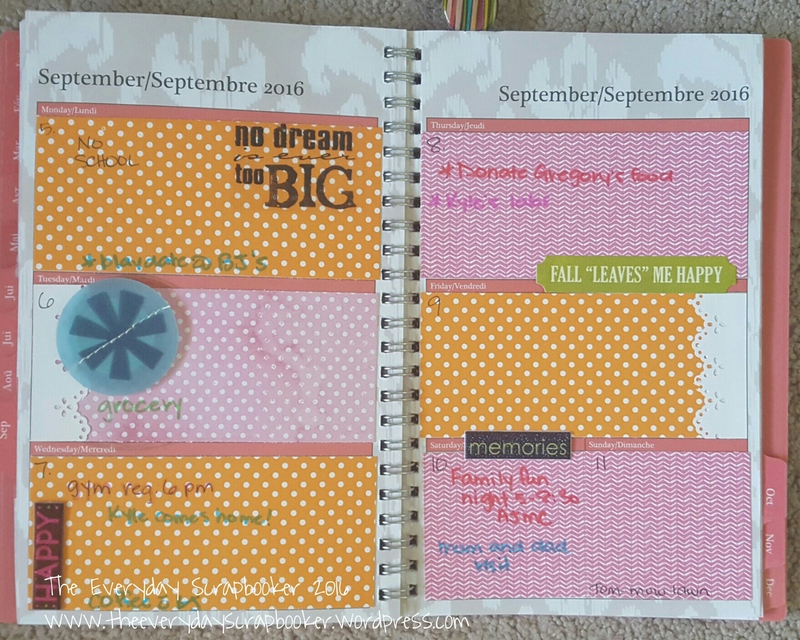 Sadly, some of the die cuts living in my scrap baskets are just way too large for my humble planner, otherwise I’d have used them here! One of the stickers I used actually came from one of my pen pals (at the moment, it feels like she’s my only pen pal, because she’s the only person who has consistently written me!) I don’t think that’s the truth- it’s just my anxiety getting the best of me. 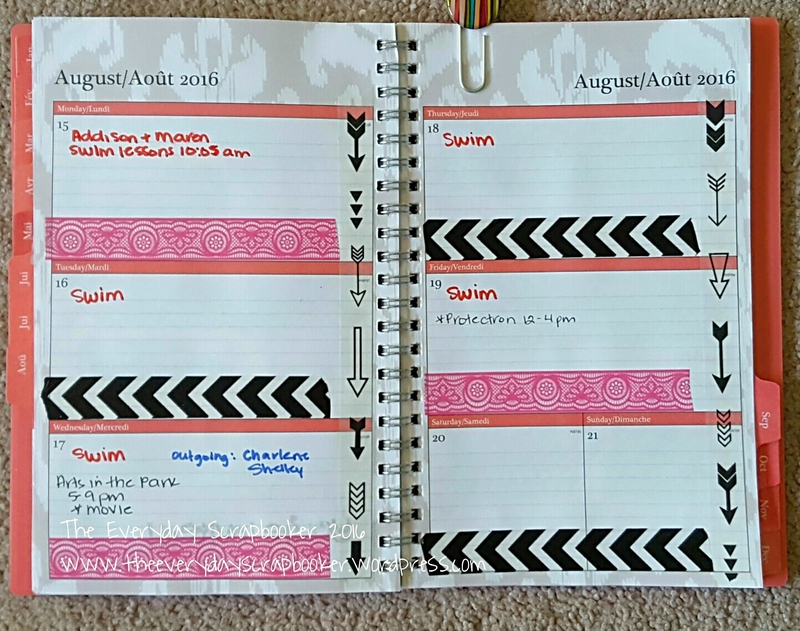 The rest of the stickers are dollar store finds- which also happens to be another terrific method for creating a shoestring planner! Stickers typically are just $1, so you can purchase a lot for a great price. Once my stash has finally dwindled (let’s face it- that won’t happen for awhile), I’ll stock up again at the dollar store and/or dollarama. Thanks for joining me- I hope something about today inspires you! 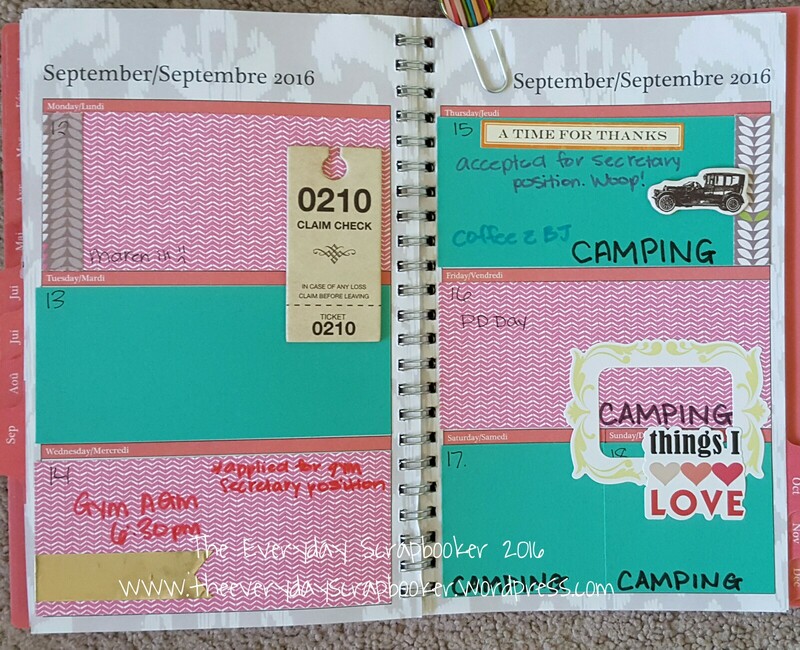 Hello friends, it’s planner time again! 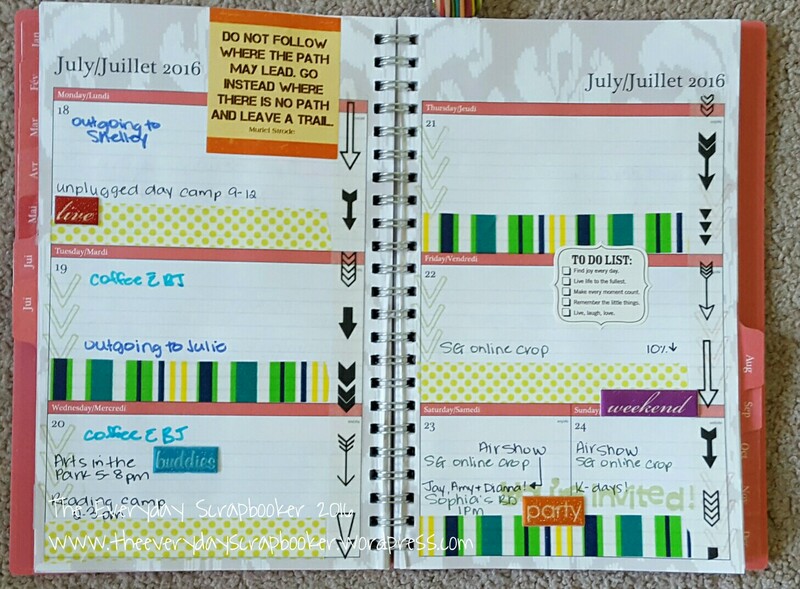 I’m loving how colorful my planner is becoming now that I’m using my awesome Dollar store felt marker find! It’s so purdy!!! Red is for reminders- which I just realized is perfect for remembering because they both start with the letter R; coffee dates are bright blue, my grocery shopping day is in lime green (green for veggies…smart, right?) and so on. I don’t want to bore you with the total run down of my color legend, so I’ll stop at this. Unless you’d like to know more! Comment if you do! I added more colorful accents from my scrap basket, and as always you can see my washi tape throughout. Swimming lessons is over now, but next week (which is actually this week) is full of day camp (and some much needed mommy me time) goodness! I hope you’ll join me again!